Sliding element is made from square aluminium tube, UHMWPE channel and 6-32 nylon screws. It consists of 1½" long mounting section(s) and 1" long sliding section(s). 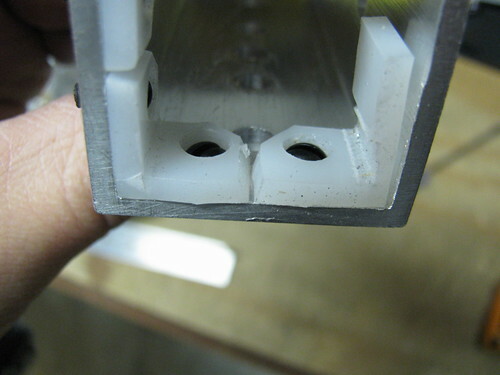 The sliding section consists of three UHMWPE angle pads placed in three corners of the tube. The pads completely cover the outer side of the rail. The pad overhangs are pushed towards the rail by 6-32 screws, which regulates the friction. 2 (out of 4) sides of the sliding section can be mounted to the perforated angle or to another sliding element. The mounting section has a pattern of holes on each side of the tube to mount the lead nut, perforated angle or another sliding element. 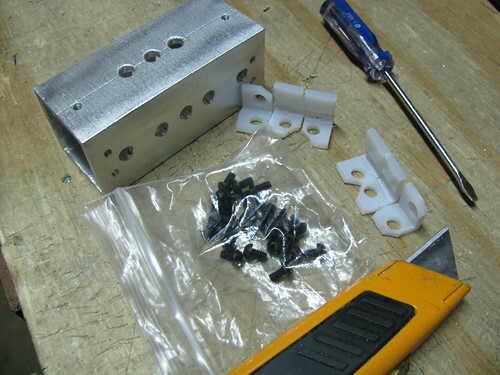 Cheaper and more widely available machine screws can be used instead of Nylon screws, but it's a matter of convenience of the assembly - steel screws need to be cut with hacksaw/file instead of the knife. Make the tube piece from SVG or PDF template, according to the instructions in Howto section. 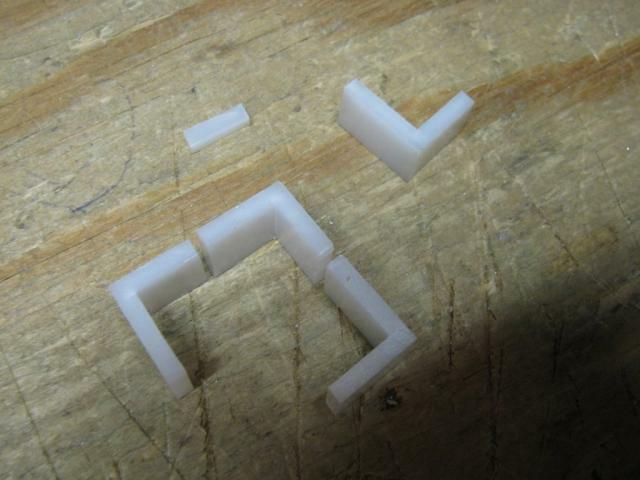 Using a knife or hacksaw, cut off a couple of 1/2" pieces of UHMWPE channel. UHMWPE is pretty hard to cut with a knife, so be careful and don't place body parts in the way of the blade. 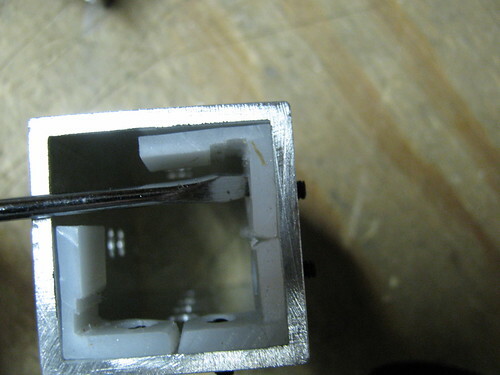 Coping saw works well for cutting UHMW PE. 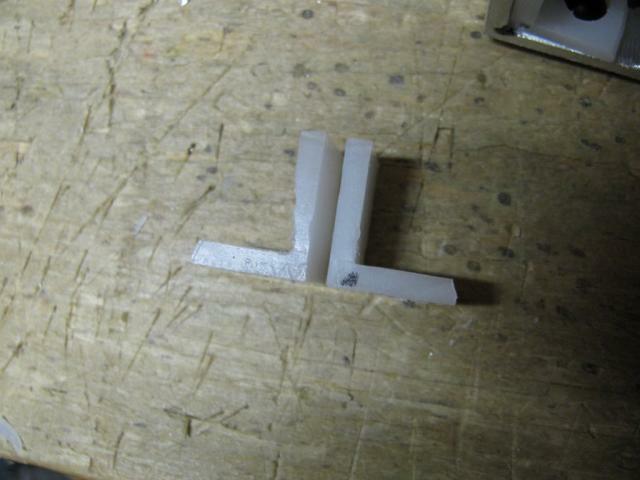 Cut the pieces in half in the middle of the base, this will make four angles 3/4" x ~5/8". 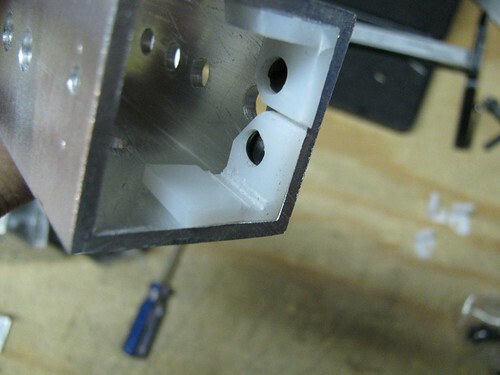 Make one 5/8" x 5/8" angle piece by cutting off about 1/8" from the longer side. 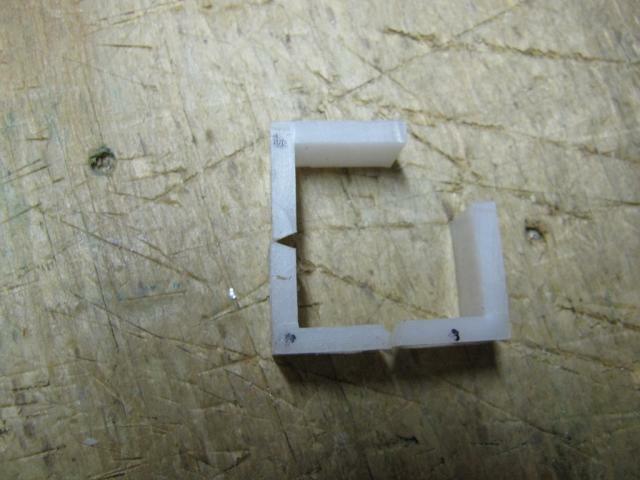 You can use another angle piece as a guide, but cut off a tad more than 1/8". 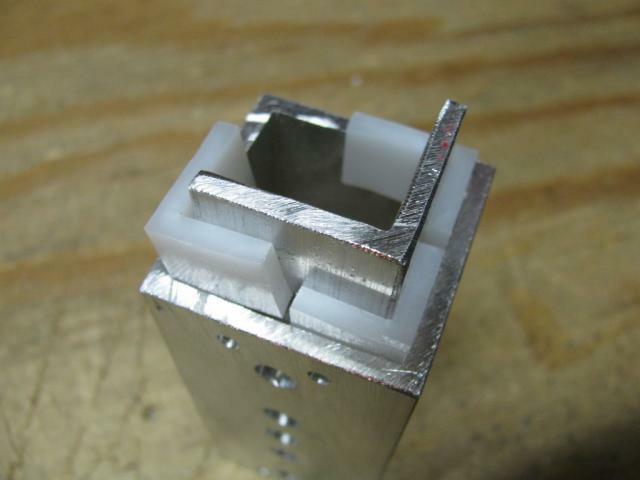 The result should be three pads that will wrap around the outer surface of aluminum angle rail (overhangs are 3/4" long). One extra 3/4"x5/8" pad remains. 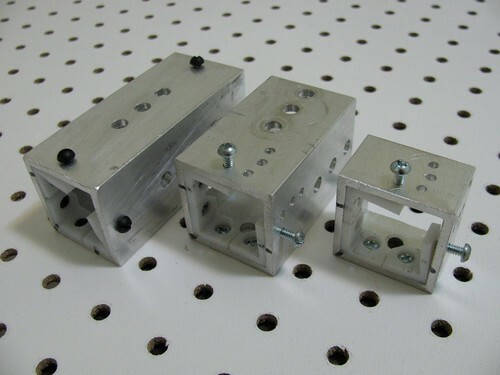 It can be used for the limit switch or for another sliding section. Align the UHMWPE pads to be flush with the sliding element tube. 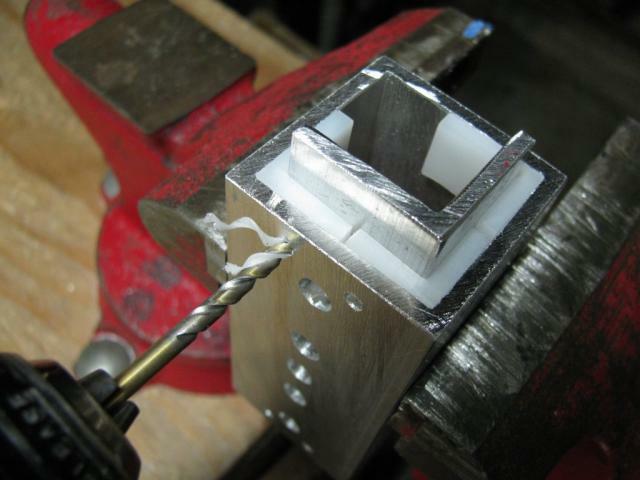 Clamp the tube in the vise and drill shallow pilot holes in the pads through the mounting holes for 6-32 screws. Mark sides with Sharpie to know which pad goes into which corner and remove the pads. 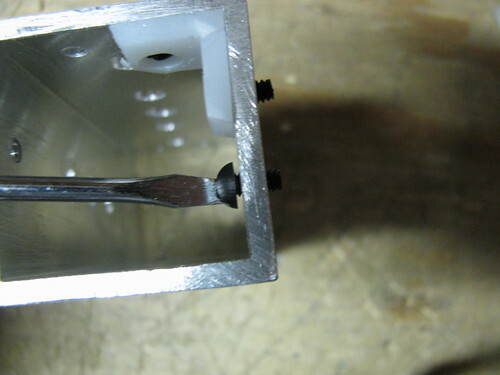 Once this is done, tap the mounting holes in the tube with 6-32 tap or 6-32 steel screw. Drill 1/4" holes in the pads where the pilot holes are. 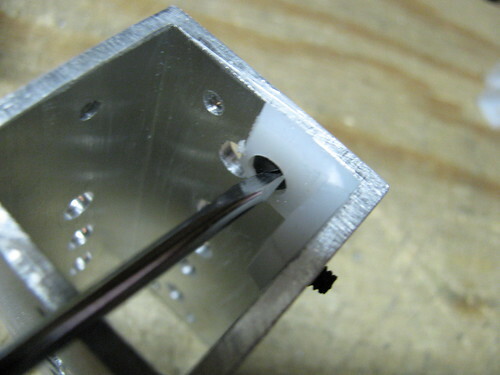 Use file to remove burrs from the holes in UHMWPE pads. 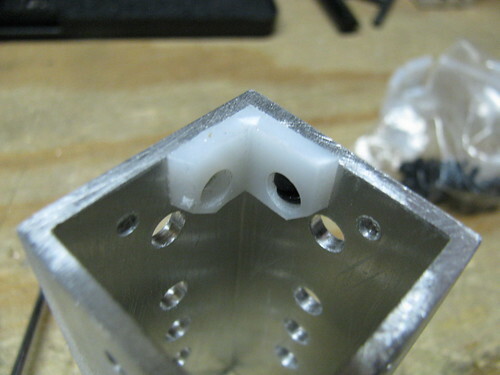 Cut off the far corner facing inside the sliding element in those sides that have the hole. Cut at 45 deg within 1/16" from the hole. This is needed for 10-24 screw head to fit inside the sliding section. In the sides with the hole, сut the edges so they are slanted and form a "V" when UHMWPE pads are put together. This is needed for the center punched angle rails to slide. Clamp the 3/4"x5/8" pad in the vise and remove material where the rail edge will touch the pad (the inner base of 3/4" side). Approximately 1/3rd of the thickness needs to be removed. 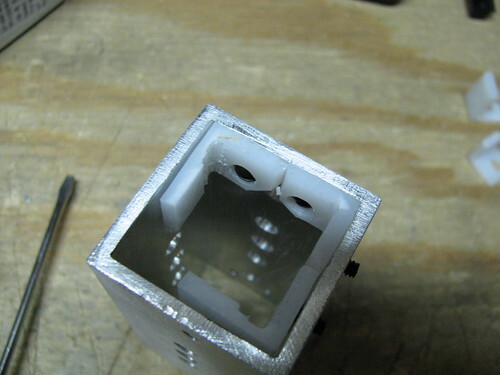 Hacksaw will work for this, but Dremel with bit #196 (7/32" high speed cutter) is a great tool to do it. This is what the result might look like. Repeat this step with the other 3/4"x5/8" pad. The pads are now ready for sliding element assembly. If your pads come in a strip, you'll need to cut them off with a knife. 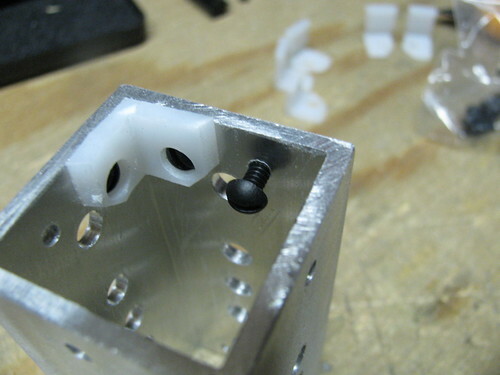 Insert plastic screw into one of the mounting hole for the center pad. This is a bit tricky, you might want to cut some material off the end of the screw to make it pointy. If your pads came in a strip, cut off the corners of the center pad, facing inside the sliding element. Cut at 45 deg within 1/16" from the hole. This is needed for 10-24 screw head to fit inside the sliding section. Snap the center UHMW pad in place. Insert another plastic screw into the pad's other mounting hole. Again, you might want to cut some material off the end of the screw to make it pointy and easier to insert. Using small screwdriver, drive the screw into the tube. 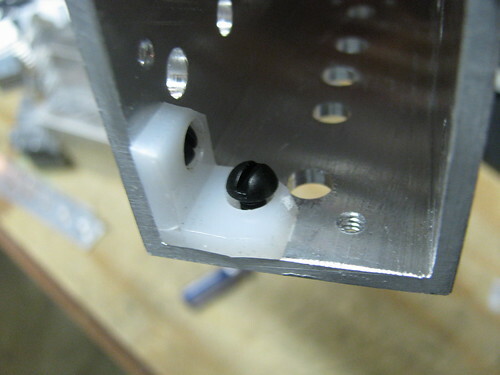 Insert plastic screw into the mounting hole for the side pad. 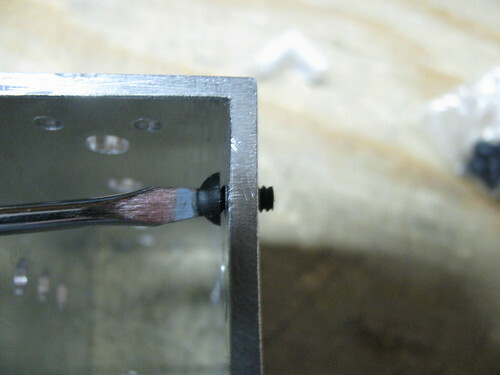 Using small screwdriver, drive the screw until there is a small gap (about 1/32") between the head and the tube. If your pads came in a strip, cut off the corner of the side pad, facing inside the sliding element. Cut at 45 deg within 1/16" from the hole. This is needed for 10-24 screw head to fit inside the sliding section. Snap the side UHMW pad in place. Repeat the steps 7-9 for the other side pad. Drive the screws a bit deeper, just to make sure they don't stick out of the pads. 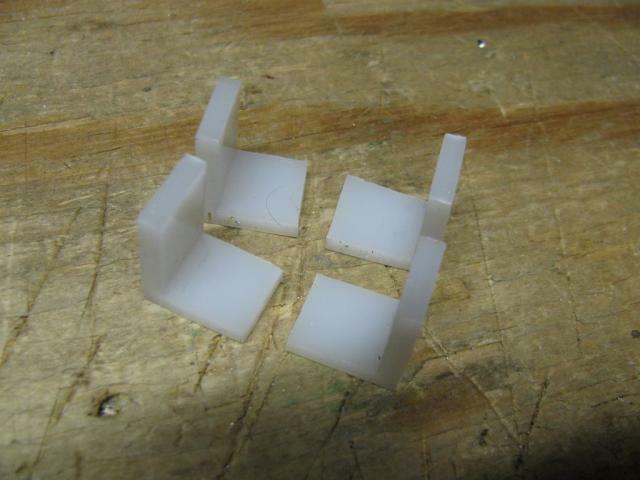 If you drive the screws of the side pads too deep, side pads will tend to fall out of the sliding element. Using knife, cut off the ends of the screws sticking out of the tube (they're actually not cut off in the pic). 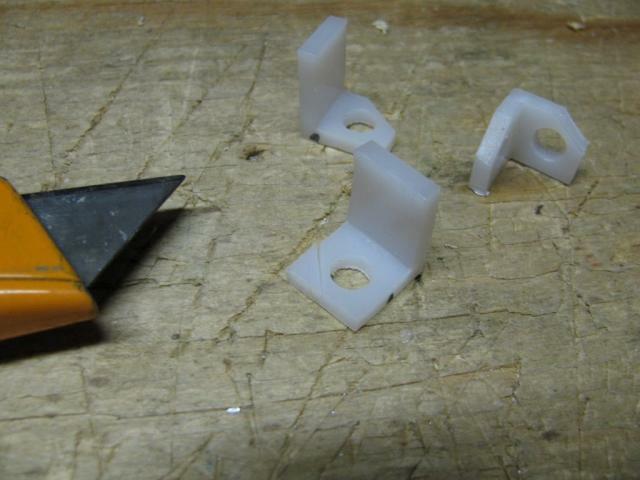 Install the pair of plastic screws in friction adjustment holes. They will press the grooved side of the pads against the angle rail. 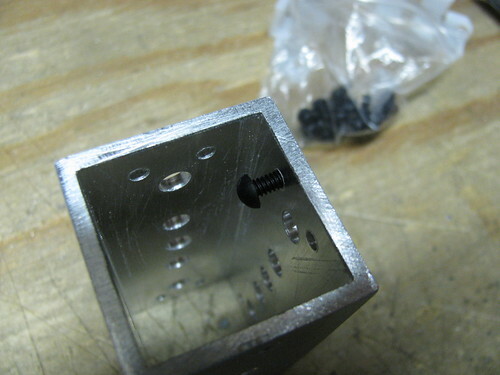 Some of the threaded holes for adjustment screws may not be tapped completely. These can be fixed with a power drill/screwdriver and a metal screw.